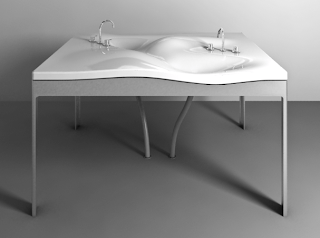 I had originally selected this sink for inclusion in our Valentine-themed feature based on its sensuous contours and its built-for-two design. It could certainly make for a compelling rendezvous spot for morning ablutions. It looks like the soldiers have gone missing and all the topo lines have washed away. Brandy. Brandy warms the heart and makes the snow melt sooner. So I'm told. It almost worked for Napoleon.